Also Called: Rattle-box, smooth seedbox, square-pod water-primrose. Stems: Erect, branched, angled above, nearly smooth to minutely hairy, often reddish. Leaves: Alternate, simple, lanceolate, 2 to 4 inches long, usually less than 1/2 inch wide, pale below; margins entire; tips pointed; short-stalked or blade tapering to sessile base; upper leaves reduced in size. Inflorescences: Solitary in upper leaf axils, few to many; stalks to 1/5 inch long. Flowers: Showy, about 3/4 inch across; sepals 4, egg-shaped to lance-ovate, 1/3 to 2/5 inch long, spreading, often reddish, tips pointed; petals 4, oblong-ovate, 1/3 to 2/5 inch long, yellow; stamens 4. Fruits: Capsule, about 1/5 inch long and wide, 4-sided above, rounded below, glabrous or hairy; seeds tiny, egg-shaped, yellowish-brown. Habitat: Wet sites; edges of streams, lakes and marshes, moist prairie ravines, roadside ditches. Comments: The petals drop easily, often lasting less than a day. When the capsule is shaken, the seeds rattle, which gives rise to the common name "rattle-box". 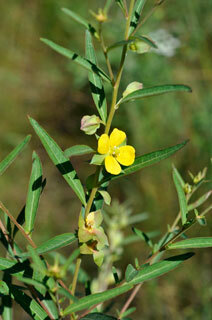 Ludwigia is named in honor of Christian Gottlieb Ludwig, a German botanist in the late 18th Century.